Scranton Products (Santana/Comtec/Capitol) solid plastic toilet partitions are the right choice for high-use facilities such as schools, universities, stadiums, arenas, parks and airports.They feature strong scratch and dent resistant surfaces that are graffiti resistant and will not rust ever! Scranton Products (Santana/Comtec/Capitol) provides low maintenance toilet paritions with proven durability and a guarantee of 15 years against breakage, corrosion and delamination of our doors, panels and pilasters. You can minimize your maintenance by eliminating the need to paint or replace rusted, dented or damaged metal and wood laminated toilet compartments. Why Scranton Products (Santana / Comtec / Capitol)? 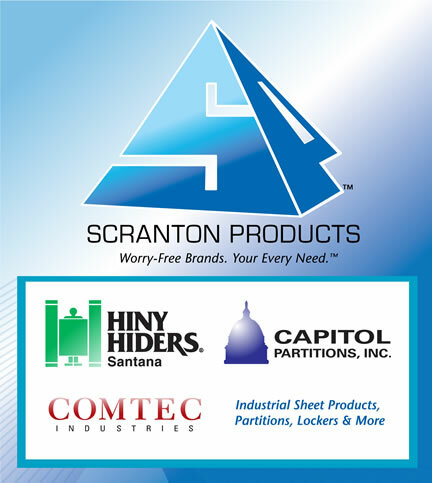 Scranton Products (Santana / Comtec / Capitol) provides a line of standard hardware that is the strongest in the industry. Add to that our optional hardware and Scranton Products (Santana/Comtec/Capitol) can meet virtually any specification. Aluminum Continuous Wall Brackets, 54"
Scranton Products (Santana/Comtec/Capitol) offers: toilet stalls, shower stalls, changing stalls, shower cubicles, urinal screens, sight screens and sheet material in 23 designer colors. Our Classics, Impressions and Evertuff EX colors are all the same cost. Using CAD/CAM software and state-of-the-art routing equipment, Scranton Products (Santana/Comtec/Capitol) can now engrave your company logo or a variety of symbols on compartment doors. Please contact Master Building Specialties, Inc. for additional details.